The shoulder joint is a complex structure that provides a full range of motion of the upper limb. It is formed by the head of the humerus and the articular process of the scapula. Fixes the joint of the whole system of ligaments. They control the volume of performed movements. X-rays of the shoulder joint is one of the most accessible and informative methods of research. This is a relatively inexpensive method of diagnosis. At the same time it gives enough information about the condition of the joint. Special training is not required. Before the procedure the patient is required to remove metal objects – buttons, jewelry, hairpins – they can adversely affect the quality of the picture. In addition, these items have a high radiographic density and can create in the picture the intense shadows that are diagnostically important areas. The is performed on a specially designed table. The position is selected depending on projection. It can be direct, lateral and axial. The sexual organs and the thyroid gland are covered with a lead apron. 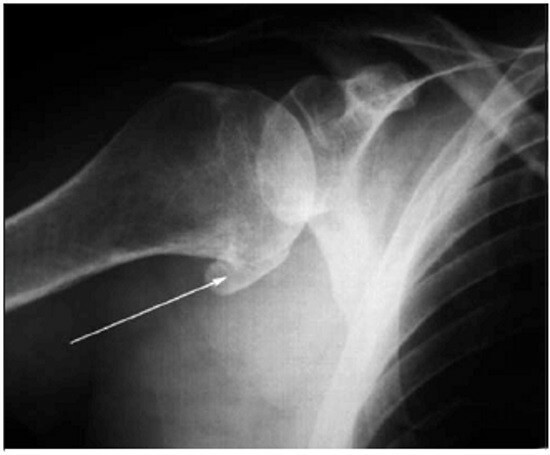 Radiographic diagnosis of luxations and subluxations of the shoulder joint is quite reliable. She comes to the aid of the Clinician in all controversial and unclear cases. On the x-ray picture is noticeably a violation of the topographic relationship between the articular surfaces. They are not adjacent to each other, disrupted the normal spatial structure. If the head of the humerus completely moved away from the glenoid cavity, and the surface not in contact with each other, talking about the complete dislocation. If the head displacement is partial, and the picture shows a noticeable contact between the surfaces diagnose a partial dislocation or subluxation. Radiological signs of osteoarthritis are joint space narrowing, osteoporosis, osteophytes. In the first stage, narrowing uneven, the edges of the articular surfaces slightly pointed – it is the osteophytes that are in early development. In the second stage, the joint space is narrowed by half, when compared with normal option. Osteophytes are quite large, well rendered. In the epiphyses of the bones are observed enlightenment, similar to cysts. Under the articular cartilage visible light strip – growth of connective tissue, subchondral osteosclerosis. In the third stage, the joint space is missing, the joint is deformed. Large osteophytes, extensive. Expressed subchondral osteosclerosis, epiphyseal cysts. At each stage the visible signs of osteoporosis – decrease in bone density. The bigger the stage, so it is more noticeable. In addition, x-ray examination of the shoulder joint helps to detect intra-articular hematoma, a collection of pus or inflammatory fluid. They are x-rays, so in the picture have the appearance of dark areas. Because of its specificity, x-ray examination has a number of disadvantages. First, on a picture it is impossible to draw any conclusions about the state of the soft tissues around the joint – joint capsule, ligaments, cartilage, muscles. Secondly, it is impossible to assess the integrity of blood vessels and nerves. In addition, x-ray picture it is impossible to assume the origin of synovial fluid as exudate or blood look the same. degenerative diseases of the joints. Absolute contraindications to study there. Refers to the relative pregnancy, breast-feeding, child age. In such situations, x-rays performed only when the potential harm from the wrong diagnosis and lack of treatment clearly outweighs the likelihood of side effects. If possible, this category of patients, prescribe other, safer methods of diagnosis. This can be ultrasound and magnetic resonance imaging. X-ray irradiation can cause mutations in cells, particularly in young and actively proliferating. But we must remember that the survey is only administered when indicated. Wrong diagnosis and delayed treatment can hurt much more than irradiation in the small doses. Analogue radiography may be computed tomography. The difference is that in conventional x-ray diagnostics, the rays passed through the patient reach the photosensitive film. The brighter the beam, the darker the spot on the image. In CT the number of these rays is read by the analysing system of the computer. On the basis of information received, builds the image. Modern scanners allow to obtain high-quality images in a matter of minutes. 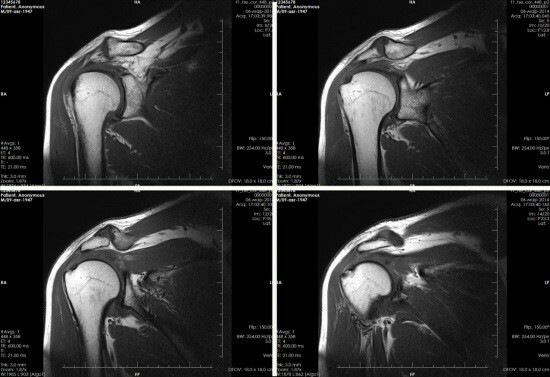 Another method of visualization of the shoulder joint – magnetic resonance imaging. Its essence lies in the ability of the protons to change their vector in the opposite direction under the influence of a powerful magnetic field. Given this specificity, MRI is often used for the examination of periarticular structures, in particular, if you suspect an accumulation of pus, blood or inflammatory fluid inside the joint. Choosing a survey method, consult with your family doctor. He will tell you what is optimal in each particular case, and, if necessary, prescribe consult related specialist.